If the answer to prayer is so positively promised in scripture, why are there so many unanswered prayers today (often misinterpreted as a "no")? Scripture teaches us that answer to prayer depends upon certain conditions. Christ spoke of faith, of perseverance, of praying in His name, of praying in the will of God. But all these conditions were summed up in the one central statement: If ye abide in me and my words abide in you, ye shall ask what ye will, and it shall be done unto you. It becomes clear that the power to pray the effectual prayer of faith depends upon the life. Let Andrew Murray show you what it means to live in Christ, and let his challenge for genuine intercessory prayer change your life - and the lives of those you are praying for. 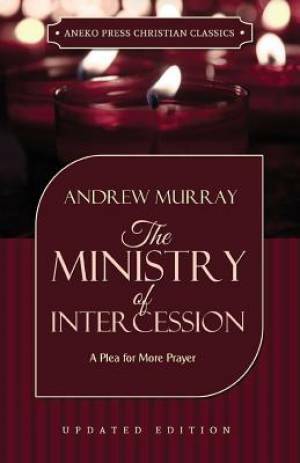 The Ministry of Intercession by Andrew Murray was published by ANEKO Press in March 2016 and is our 51105th best seller. The ISBN for The Ministry of Intercession is 9781622453399. Be the first to review The Ministry of Intercession! Got a question? No problem! Just click here to ask us about The Ministry of Intercession.